Western blot analysis of extracts from 293T cells, untransfected (lane 1) or transfected with GFP tagged wild-type Akt1 (lane 2), E17K mutant Akt1 (lane 3), wild-type Akt2 (lane 4), or mutant E17K Akt2 (lane 5), using Akt (E17K Mutant Specific) (D1T7P) Rabbit mAb (upper) and GFP (D5.1) XP® Rabbit mAb #2956 (lower). Immunoprecipitation of Akt (E17K) from 293T cell extracts. Lane 1 is 10% input, lane 2 is Rabbit (DA1E) mAb IgG XP® Isotype Control #3900, and lane 3 is Akt (E17K Mutant Specific) (D1T7P) Rabbit mAb. 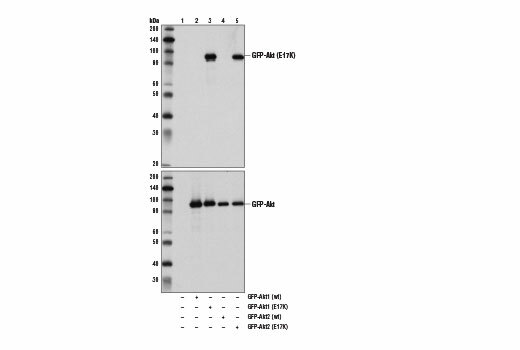 Western blot analysis was performed using Akt (E17K Mutant Specific) (D1T7P) Rabbit mAb. Confocal immunofluorescent analysis of 293T cells transiently transfected with GFP-tagged wild-type Akt1 (upper left), GFP-tagged mutant E17K Akt1 (upper right), GFP-tagged wild-type Akt2 (lower left), or GFP-tagged mutant E17K Akt2 (lower right) using Akt (E17K Mutant Specific) (D1T7P) Rabbit mAb (red). Blue pseudocolor = DRAQ5® #4084 (fluorescent DNA dye). Note: Green - GFP-tagged wild-type Akt and E17K mutant; Red - Akt (E17K mutant); Yellow - overlay of GFP and Akt (E17K mutant). 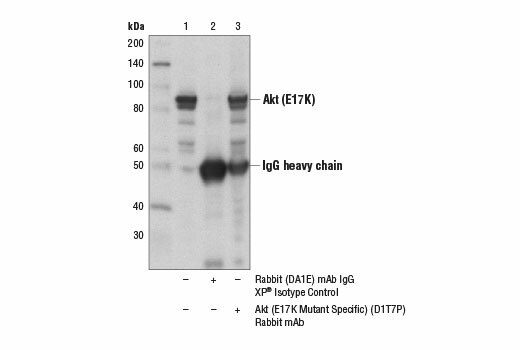 Akt (E17K Mutant Specific) (D1T7P) Rabbit mAb recognizes levels of transfected E17K mutant Akt1 and Akt2 protein. This antibody weakly recognizes transfected E17K mutant Akt3. Monoclonal antibody is produced by immunizing animals with a synthetic peptide corresponding to E17K mutant sequence of human Akt1 protein. Mutation of the glutamic acid at residue 17 to lysine (E17K) of Akt was initially identified in human breast, colorectal, and ovarian cancers (20). This conserved glutamic acid residue is located at the lipid-binding pocket of the Akt1 plextrin homology domain. 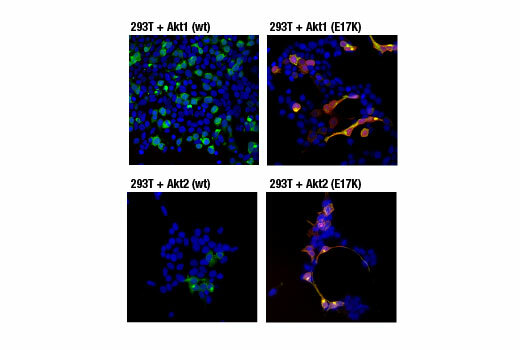 The E17K mutation increases the affinity between Akt1 and phospholipids at the plasma membrane, leading to increased Akt1 recruitment, super-activation of the Akt pathway, cellular transformation, and tumor formation (20,21). Additional studies detect the presence of the Akt1 (E17K) mutation in multiple cancers, including lung cancer, prostate cancer, and endometrial carcinoma (22,23). The presence of mutant Akt3 (E17K) protein has also been seen in cases of melanoma (24). Carpten, J.D. et al. (2007) Nature 448, 439-44. Landgraf, K.E. et al. (2008) Biochemistry 47, 12260-9. Malanga, D. et al. (2008) Cell Cycle 7, 665-9. Cohen, Y. et al. (2010) Gynecol Oncol 116, 88-91. Davies, M.A. et al. (2008) Br J Cancer 99, 1265-8.